Our Financial Peace University class starts this Wednesday, January 15, 2014 at church. Today I spent quite a while working on getting my box and desk space ready. 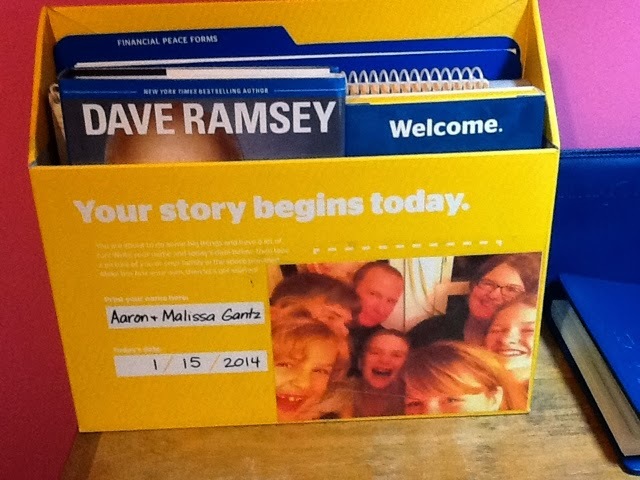 I'm a nerd, so I actually filled out the lines on my box and added a family photo. I can't help it....I'm just a nerd. Working on getting my things together, I was thinking about what I hope to accomplish during the nine week class. I'm realizing that FPU is much more than just paying off debt and living within our means. Really, debt is a small part of it. Of course, we will have to work hard to get it cleaned up and payed off so that we can put the rest of what we learn into practice. It covers life insurance, estate planning, giving, investing and other big, life-altering issues. I'm looking forward to the classes and working through everything with Aaron!